When an agent creates a new ticket, by default, that user is assigned to the ticket. Click here for additional information on creating a new ticket. In the Customer record, a “Default User” can be indicated. Any new ticket for this customer will be initially assigned to the default user. Click here for more information on Customer settings. A user can take ownership of any ticket by clicking on the “Take Ownership” button from the “My Tickets” grid or from the top toolbar of any ticket. Ticket Automation can assign a ticket to a user based on specified conditions. Any user can reassign a ticket to another user from the My Tickets window using the “Assign user” button under “More” on the top grid navigation. This list begins with unassigned, and then is followed by the the user who last had ownership of the ticket (the sender). Next in the list are the users who are members of the group to which the ticket is assigned to (if any). 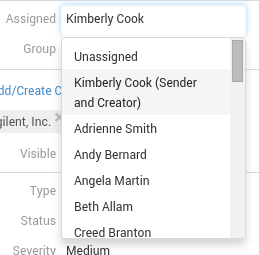 The remaining users are listed in alphabetical order.